Prelude Strings is a new initiative at Norfolk Centre for Young Musicians (NCYM) and is open to complete beginners aged 7+. These classes will encourage children to explore the joy of making music. In the first year they acquire the simple skills and fine muscle control necessary to develop technical proficiency on a Violin, Viola or Cello. Singing, rhythm and movement activities will teach an instinctive connection between what these young musicians do with their hands, their voices, their eyes, their ears and their intellect. This sense of connection is the crucial foundation for a rich life-long experience of music. 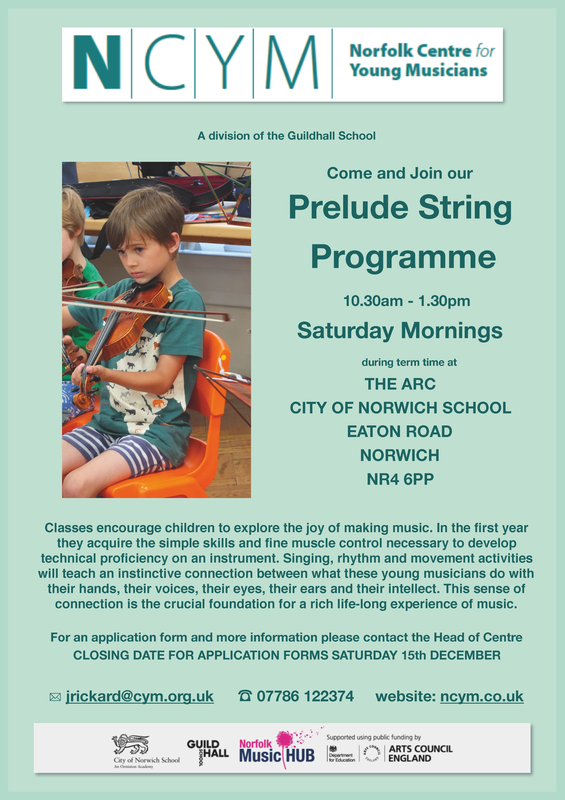 The Prelude Strings programme will take place from 10.30am – 1.30pm on Saturdays during term time at The Arc, City of Norwich School. NCYM is a division of the Guildhall School of Music & Drama. Closing date for application forms is Saturday 15 December 2018.